The following is a brief history of the islands of Hawaii. 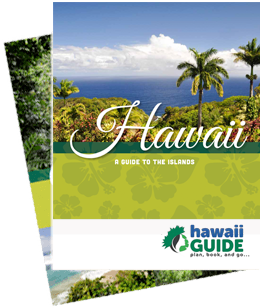 Specifically this text is pulled directly from our Hawaii - Mile by Mile Guidebook. We hope it helps provide our guests with a better understanding of the islands and the people that live upon them. Thousand of miles from the nearest continent the volcanic mountains stood somber and alone in the Pacific, void of nearly all life. Lifeless they would remain if not for the birds, the currents, and the wind. Seeds were carried by the tides that washed across the shores. Storms brought more seeds with their howling winds and rains. The birds, like the small golden plover, brought the rest. Eventually the Hawaiian islands would be covered with extensive forest habitats, shrubbery, and grasslands. Soil and precipitation differences around the islands would cater to all kinds of plant-life. In time, the foreign species would become unique to all the world, found only in Hawai'i. Today, we call them endemic Hawaiian species like the Nene (Hawaiian goose) and silversword (which is a relative of the sunflower believe it or not). You will find them no where else on the planet. These species had thousands, if not millions, of years to develop into unique flora and fauna. And for thousands and thousands of years they were undisturbed by the ways of humans. Today, many of these species are not so lucky. The 'Akiapola'au (photo seen above) is just one example of a species that is fading fast. Most experts predict that their numbers have dwindled to between 1,000-1,500. They can be found only on the Big Island. We were very lucky to see one as recently as 2006. Today most anthropologists will tell you that the original settlement of the Hawaiian islands was by Polynesians from the Marquesas Islands around 300-500 AD. This group of early settlers is today believed to be where the legend of the menehune originates. A second wave of settlement followed during the 9th and 10th centuries from Tahiti, radically changing the islands and the culture that existed there. They came in their double-hulled canoes, some 3,500 miles south of the Big Island. Using the wind and paddle they navigated themselves in uncharted waters to the peaks of this foreign land. Arriving as early as 2,000 years ago, the Polynesians came in waves of migration bringing most everything with them they'd need to survive on the shores of Hawai'i. Banana and coconut trees, dogs, hogs, rats, and chickens came with them from thousands of miles away. Their knowledge of the sea also provided ample seafood. Weaving, wood and stone-carving allowed them to grow crops and farm. Their population would flourish here, and by the time Europeans first made contact in 1778, their numbers were estimated at approximately 800,000 to one million. Once established, the Hawaiians had no further need to obtain supplies from their old homelands, and thus underwent centuries of isolation in what is still today the most isolated spot on the planet. The Polynesians governed themselves by a set of rules, a kapu system with chiefs and ali'i (royalty). Their culture was strict and abundant in both mythology and lore. Their religious system was very deeply tied to nature, and there were hundreds upon thousands of gods in the system. Four main gods were especially important to the Hawaiians: Ku, Kane, Kanaloa, and Lono. One of their most powerful deities, Pele, made her continuous presence known on the Big Island. Her home was, and still is, Kilauea's Caldera, and her frequent eruptions are a constant reminder of her existence. She is a goddess of fire who changes form at will. A beautiful woman one minute a fireball the next, Pele is known for here fiery temper. Even today many residents hope to appease Madame Pele by placing offerings on the rim of her home. As recently as 1990, Pele made her temperament known by destroying over 200 homes along the southeast shoreline. The Polynesians were stewards of both land and sea, guardians of all that existed here. They were careful to never over-fish the reefs or streams and to never abuse the aina (land) which so graciously supported them. They skillfully diverted water into irrigation channels to flood their taro fields, so that their staple food of poi could be produced and eaten by generation upon generation. Today these canals still criss-cross the island and taro still grows in beautiful valleys. Two of these valleys were some of the most prosperous in Hawai'i Pololu and Waipi'o, both on the northeastern Kohala coast of the Big Island. Waipi'o even today is still known for its taro fields. With the sighting of great white sails on the horizon, the likes of which the Hawaiians had never seen, the islands were forever changed. Captain James Cook, one of the world's most recognized British navigators, sailed into Waimea Bay on the island of Kaua'i first in 1778, and then onto the Big Island at Kealakekua Bay in early 1779. At the time of Cook's arrival on the Big Island some 10,000 or more Hawaiians were in the midst of their makahiki celebration, a celebration that honored the god Lono. Cook arriving on his ship with white sails (similar to that of the god Lono's flag) was likely mistaken as the god Lono and treated accordingly. During his two week stay on the Big Island, he was honored in ceremony upon ceremony. Cook and the Hawaiians entertained each other mutually with their own inventions before the famous navigator set sail away from the islands. Shortly there-after, the makahiki celebration ended, and the bay was made kapu (off-limits). Meanwhile, a storm off-shore had damaged one of Cook's ships. Naturally he returned to the bay expecting the same hospitality he'd received before. But many of the Hawaiians had grown tired of the sailors' presence in the bay, and despite the fraternization that took place, one of Cook's smaller boats was stolen. It should have ended there, but Cook instead decided to go ashore and kidnap Chief Kalaniopu'u until his boat was returned. Intentional or not, Cook was stabbed in a skirmish which left him dead at the hands of Hawaiian warriors. Today, a white monument, stands erected at the northern end of the bay where Cook met his demise, a solemn reminder of this event. This is the only piece of land in the Hawaiian chain that remains British soil. Today the area has become most popular for its snorkeling and kayaking. Cook's presence forever changed the islands. Chiefs were always at war with one another in Hawai'i. Never had a single ruler controlled all the islands. But a young chief by the name of Kamehameha, a native of Kohala on the Big Island, had taken note of the Westerners weapons and set out to conquer all the islands in the Hawaiian chain: to be their first king. By 1791, he had defeated his cousin and arch-rival on the Big Island, and by 1795, he had conquered Maui, Moloka'i, Lana'i, and O'ahu. In 1810, the chief that ruled Kaua'i, seeing all that had happened with Kamehameha and his warriors island by island, pledged his loyalty to Kamehameha. With that act, Kamehameha (seen here) fulfilled the prophecy that he would become the first King of Hawai'i. Kamehameha ruled with a tight grip. He wished to prepare the islands for increasing contact with the west - sailors, whalers, and entrepreneurs. Unfortunately Kamehameha could not prepare the islands for what would affect them the most, venereal disease. Over the next century the Hawaiian population was decimated by the likes of influenza, typhoid fever, and measles. Estimates say the population decreased by as much as 80%. It was greed that would next change the islands. Riches were to be made of the forests of Hawai'i with the sweet smelling sandalwood, a huge commodity in the orient. Guns, boats, and even canons made their way into Hawaiian life, and for the first time the concept of owning land came into existence. In 1819, when Kamehameha died, so did the remainder of Hawaiian life. A short time later Kamehameha II, at the behest of Kamehameha I's wife, Ka'ahumanu, broke the kapu system that had ruled the islands for generations. A year later, the missionaries arrived from Boston. In early April of 1820, the first Christian missionaries stepped off their ship from Boston to, yet again, forever change the islands. In the wake of the kapu system being destroyed, many argue the Hawaiians were a people without a religion. Ka'ahumanu and Kamehameha II both quickly became converts of Christianity. The missionaries, recognizing what had just happened in the islands, were quick to destroy many ancient alters and heiau (temples), and quickly replace them with churches (many of which still stand). Today the largest religious groups remain Roman Catholics and Protestants. Even Pele herself was defied when Kapiolani, high chieftess to the Big Island of Hawai'i, decreed that Jehovah was her god. When Pele remained quiet, the Hawaiian people believed, and many converted. A similar event took place in the mid-1970's, where again Pele was denounced, and in a twist of irony the volcano erupted afterwards. However, the missionaries brought a skill to the islands that would put Hawai'i on the map as far as the rest of the world was concerned, reading and writing. Hawai'i eventually soared to have the highest literacy rates in the United States. There had been no previous written language in Hawai'i until the missionaries' arrival. Everything was passed down by word of mouth. It was for this reason the Hawaiians could recite nearly the entire Bible from memory, an astonishing feat to the missionaries that taught them. It was the children of the missionaries' families that would ultimately make the greatest change in Hawai'i. Ideally the families would have returned home as they were supposed to have done but instead stayed on the island and began a practice no Hawaiian had ever heard of, owning land. Western law also made its way into Hawaiian life. The Hawaiian Constitution came into existence by 1840, along with a supreme court and a parliament. Land issues continued to be a large focus in the coming years. By 1848, land was divided into thirds - one for the royalty, one for the government, and one for the common people. Two years later foreigners could buy land outright, and that they did. Led by the missionaries' descendant's, a great agricultural boom occurred in Hawai'i in the early 20th century, bringing more and more immigrants from Japan, China, and the Philippines to work in the growing fields of sugarcane, pineapple, and other large crops. Hawai'i became a melting pot of world cultures, faiths, and customs, which forged a new identity that still holds true today. Oil discovered in the heart of America lead to the end of the whaling era, though whales had been so depleted in the waters off Hawai'i that the industry barely existed. Sugar was the new king of the islands, and would continue to be well on into the twentieth century. Today the industry is all but dead in the state, and the economic impact of its absence is still felt in many areas. With the multitude of foreign changes occurring in Hawai'i the conflict between royalty and the outsiders was bound to grow. With the U.S. military already showing a strong presence in the region (especially Pearl Harbor), it was only a matter of time before what happened, did. U.S. businessmen convinced the military that they were still U.S. citizens, and thus must be protected as such. When the businessmen seized control of the islands and took power away from Liliuokalani (the existing Queen), the military felt obligated to protect the Americans. The Republic of Hawai'i was formed. In 1898, the U.S. finally annexed Hawai'i as a territory. Sixty-one years later the voters of Hawai'i approved statehood. The Big Island, Maui (including Moloka'i and Lana'i), O'ahu, and Kau'i all became one of four counties in the 50th state of the union. Today much debate continues over what happened at the end of the 19th century. The Big Island is a growing center of both education and research. Home to one of the University of Hawai'i's campuses in Hilo, the Big Island is renown for its study of astronomy, alternative energy (wind power, geothermal, etc), ocean research, and much more. Tourism is responsible for a large portion of the county's annual revenue, though various agricultural crops also make their mark - including flowers (especially orchids), macadamia nuts, and coffee. Many say the Big Island is getting bigger all the time. Perhaps it was Kamehameha's dream, perhaps not... we'll never know for sure. The racial, religious, and cultural background of Hawai'i has changed drastically over that time. Over the last few decades, the Hawai'i of old has reemerged bringing a great sense of pride to the remaining native Hawaiians. The hula, chant, and old ways are being reborn. The change from an agricultural hearth to a tourist destination has also now exposed Hawai'i to people the world over. A state with a population of only 1.2 million has experienced tourism numbers floating around 7 million in recent years. The influence has been both positive and negative from various points of view. Today, most of the state's residents reside on the island of Oahu, some 60% in Honolulu alone which is the 11th largest city in the United States. A few other quick tidbits of information regarding Hawai'i's culture. If you hear the term "Hawaiian" it is in reference to someone's race only, not where they are. Hawaiian implies they have pure Hawaiian blood in their veins. Locals are typically folks who were born and raised here, but are not necessarily pure Hawaiians. A kama'aina is someone who has lived here a while but typically was not born here. Lastly, the term haole is used for all persons who are white, born here or not.